Each year we publish our Standards and Quality Report. The report contains a summary of our Key Strengths and our Development Priorities for the session ahead. The report summarises our view of the quality of the education we provide for our young people. Our Standards and Quality Report also contains the results or analysis of any Parental, Pupil or other survey that we may have carried out and that inform our understanding of how we are doing. The priorities for development that we identify through self evaluation become the starting point for our School Improvement Plan. This is a Three Year plan, updated at least once annually and reviewed throughout each session. In addition to our self-evaluation of our practice, Education Scotland visit schools to carry out Inspections. Charleston Academy was inspected in 2010 and the latest report from Education Scotland is available below. Finally, Highland Council’s Quality Improvement Officers regularly visit all schools in the authority and evaluate Learning & Teaching and Attainment & Achievement as well as other areas that are part of our core practice. 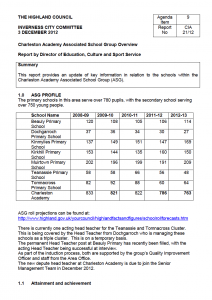 They visited Charleston Academy Associated School Group in 2012 and their report is below. 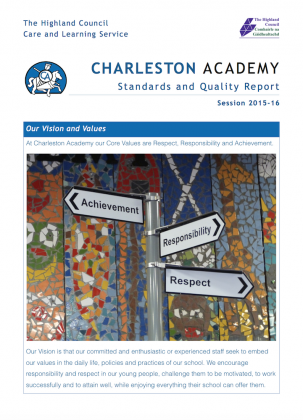 A full Quality Improvement audit of Charleston Academy was carried out in June 2015.